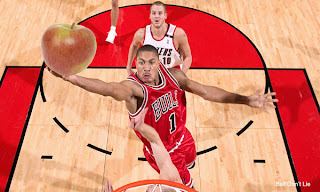 My Life and Activities here in KSA..: Derrick Rose cuts apple,arms.. According to the Chicago Tribune's Full-Court Press blog, Bulls rookie Derrick Rose missed Monday's practice after he needed 10 stitches to close a gash suffered at home while — you're not going to believe this one — slicing an apple in bed. Amazing. "It was a silly incident," Rose said. "I was cutting up some food and I laid on a knife getting lazy in bed. I went to go get a bottle of water, came back, forgot the knife was there, then sat down and sliced my arm." Rose is expected to play Tuesday night against the Knicks at the United Center, which is good news, but it begs the question: why is Rose cutting Red Delicious apples with a machete? That seems excessive.